The exhibition in Florence at Palazzo Strozzi ” Anni Trenta. Arti in Italia oltre il Fascimo “ (The Thirties. Art in Italy beyond Fascism) up to January, 27th 2013 really deserves a visit. On show the masterpieces of over forty leading artists, including Mario Sironi, Giorgio de Chirico, Alberto Savinio, Achille Funi, Carlo Carrà, Corrado Cagli, Arturo Nathan, Achille Lega, Ottone Rosai, Ardengo Soffici, Giorgio Morandi, Ram, Thayaht, Antonio Donghi, Marino Marini, Renato Guttuso, Ivanhoe Gambini, Carlo Levi, Filippo de Pisis, Scipione, Antonio Maraini and Lucio Fontana. 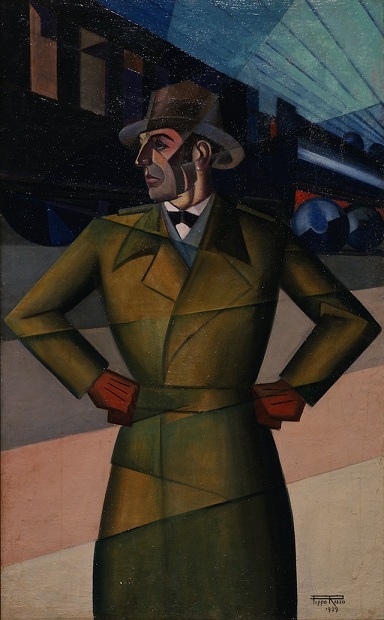 The Italian 30s, characterized by the dictatorship of Mussolini, expressed an extremely active artistic background, featuring classicism, futurism, expressionism, abstractionism, which can’t be, grossly and tout-court, oversimplified as lifeless and provincial art inside the controversial issue of art and fascism. Two remarkable previous exhibitions focused on the same subject, the one held by Carlo Ragghianti in 1967 in Florence and the other one at Palazzo Reale in Milan in 1982 organized by Renato Barilli, Luciano Caramel, Enrico Crispolti and Vittorio Fagone. Both of them paved the way for following studies, more able to overcome the negative assessments and the enduring prejudices on the art which flowered on the sinister rise of fascism. The perspective of the present exhibition at Palazzo Strozzi, organized by Antonello Negri, Silvia Bignami Paolo Rusconi, Giorgio Zanchetti e Susanna Ragionieri is probably getting a wider historical detachment from the political framework. A keener sensibility is now able to clearly establish a shrewd assessment of the works’ artistic value, telling them apart. On one side the politically functional paintings which heavily suggest embarrassing flattery subjects such as the ones exhibited at the 1939 Cremona Prize or at the Biennale di Venezia or the Quadriennale of Rome. 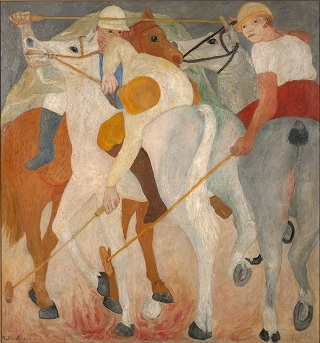 On the other side the ” more liberal” works employing free languages, unrestrained, at least, until 1938, when the racial laws implied the condemnation of the vanguard art. 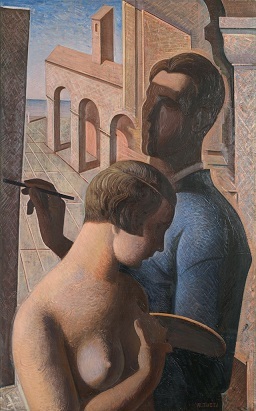 In fact, initially unchecked by a strict political power some young artists could exhibit in the Exhibition of the Fascist National Union of Fine Arts, held in Florence in 1933. Among them Guttuso, Birolli, Fontana, Sassu who gradually would open up to new European trends, together with other artists, the so called “ Sei di Torino” . 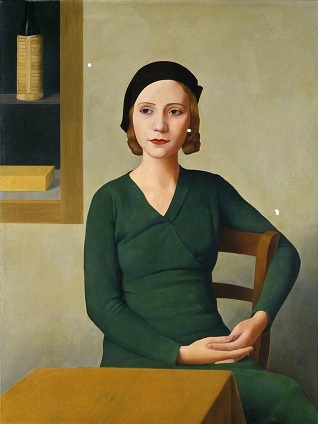 Under the guide of Felice Casorati they breathed a new air, thus overcoming the gloomy inner horizons in the approach of the broader issues of the Fauves, Modigliani, Manet, Picasso, Matisse, Braque or the German Expressionism. A brave new world, labelled by the pure German art as degenerated. 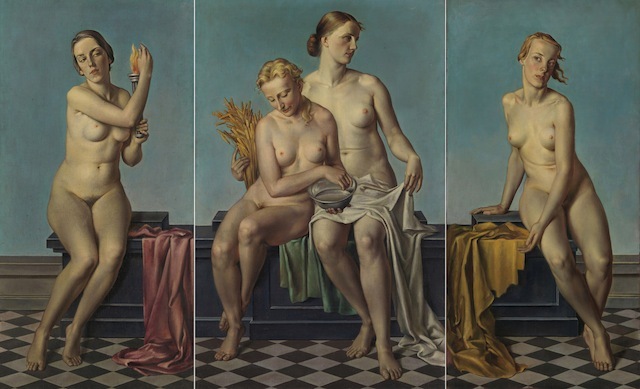 Thence the symbolically meaningful painting of nazi art, shown for the first time in Italy ” The Four Elements” by Adolf Ziegler, the artistic advisor of Hitler, featuring four naked female figures. The exhibition, divided into several sections, focuses on artists according to various geographical areas. Milan with masterpieces of Sironi, Martin, Carrà, Funi, Adolf Wildt. Florence with Soffici e Rosai. Rome with Donghi. Turin with Casorati and the “Six from Turin” and last Trieste with Nathan, Bolaffi and Sbisà. The section ” I Giovani e gli Irrealisti ” numbering Sassu, Birolli, Fontana, Gentilini, Cagli, Guttuso, Prampolini, Licini and Radice witnesses the variety of free languages. “ Gli artisti in viaggio ” (les Italiens de Paris) together with Vinicio Paladini, much influenced by Berlin cultural background, belie the cultural isolation. A last remark on the Milan Triennale of 1933 which set forth the modernization of the country, featuring an essential esthetics where design represented a turning point in Italian lifestyle thanks to its ideas still relevant to modern and dynamic man. Questa voce è stata pubblicata in Art and accommodations, Senza categoria e contrassegnata con Achille Funi, Achille Lega, Alberto Savinio, Antonio Donghi, Antonio Maraini and Lucio Fontana, Ardengo Soffici, Arturo Nathan, Carlo Carrà, Carlo Levi, Corrado Cagli, Filippo de Pisis, Giorgio de Chirico, Giorgio Morandi, Ivanhoe Gambini, Marino Marini, Mario Sironi, Ottone Rosai, Palazzo Strozzi ” Anni Trenta. Arti in Italia oltre il Fascimo “, Ram, Renato Guttuso, Scipione, Thayaht, The Four Elements by Adolf Ziegler. Contrassegna il permalink.